Learn more about trends here. To create a report, click on your early learning service’s ‘Reports’ tab or link in the menu. For children's learning trends click the ‘Learning trends’ tab or for teaching trends click the ‘Teachers activity’ tab. 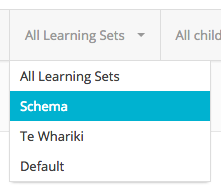 Click the 'all learning sets' drop down filter. Selecting a set will filter the data by the tags in the selected set. Click the 'All children' drop down filter. Select the children you want to filter the data by. 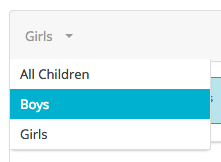 You can refine the group of children by room, or gender by clicking the drop down filter on the left of the child selection box. If you are on the 'teaching trends' page you will be able to select teachers to filter the data rather than children. Toggle between tags, folders and sets to see filter the data displayed. 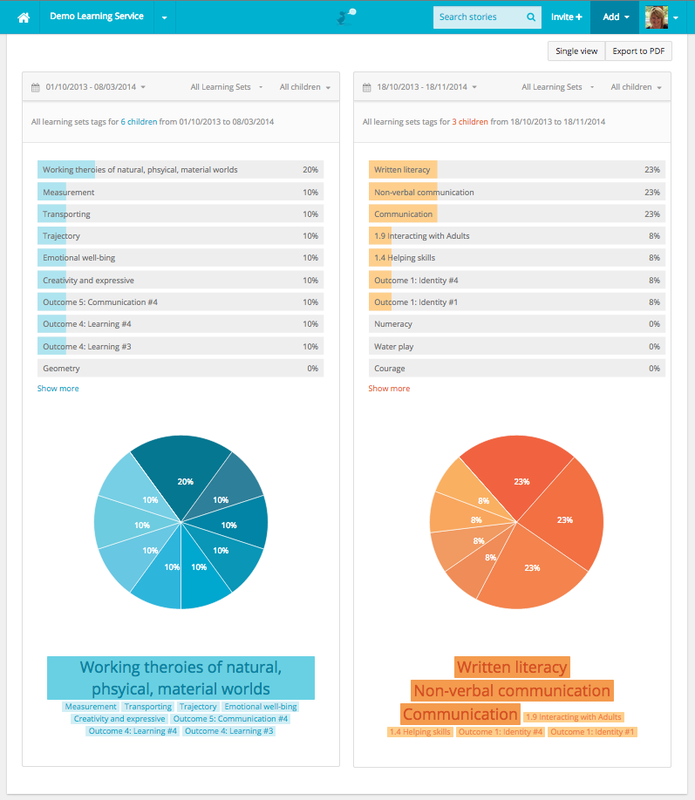 By clicking on ‘split view,’ you’ll also be able to compare data sets. For example you might like to look at a child’s learning over the last three months vs the 3 months before that or the same time last year. Or, you might want to look at what learning is happening for boys vs girls, one children vs the group of children, or one group vs another. You’ll immediately be able to observe differences/similarities to inform your planning and programme design for individuals or the group of children at your early learning service. To export your data as a PDF for printing click the 'Export to PDF' option on the top right of the page.